-Click for disclaimer,and to read more. Congrats to Laura Bryant,for filing timely your lawsuit against four caseworkers,one supervisor in county of Cumberland,in North Carolina! 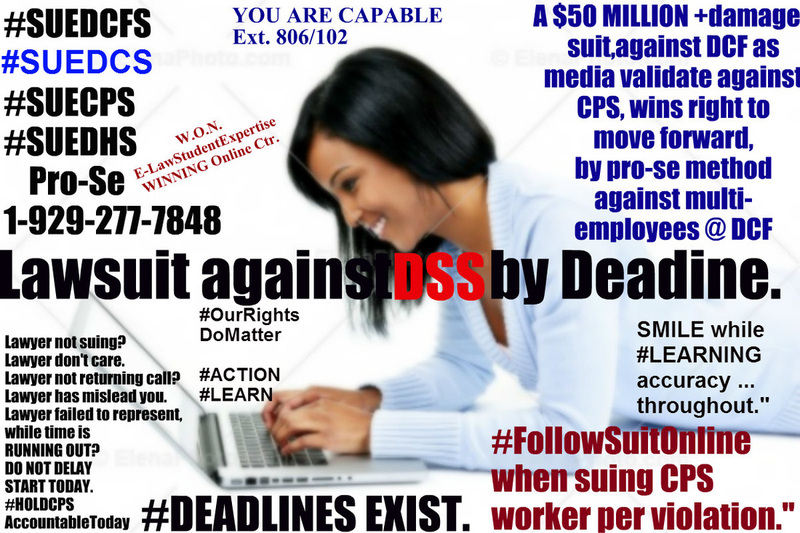 DSS now will continue to do what is right,because your TIMELY,and properly now suing for such money damages,per federal civil right violation.We are so happy to be a part of it ma'am. Such lawsuit above was filed by such GOOD parent, in North Carolina ONLY when she reached law student(s)with top notch expertise in the field of tort;sovereign;legal federal continued violation;harming one's child,grandchild,and nationwide astute assistance,involving winning already against cps,by one's own file pro-se timely nationwide.Such parent reside in N.C. and had not 1 attorney CARE enough to timely file her suit. Laura found bellas research online students clinic,the only center of its kind, in the nation,verified and supported by lawyers throughout our nation,like Jay Chapman in Tx., to Shawn McMillan in Cali,to Elaine L.Donnelly,North Carolina attorney,to Jonathan Gordon New Jersey. Such lawyers,are not suing for many CPS,but have had expertise in the field of complex tort action;lawsuit in federal court etc. state,and have supported our incredible Student Of Law Ctr.for years,we thank ALL lawyers who are showing interest with the nation first student of law,pro-se self file lawsuit clinic,for the TRULY INNOCENT ext. 102. 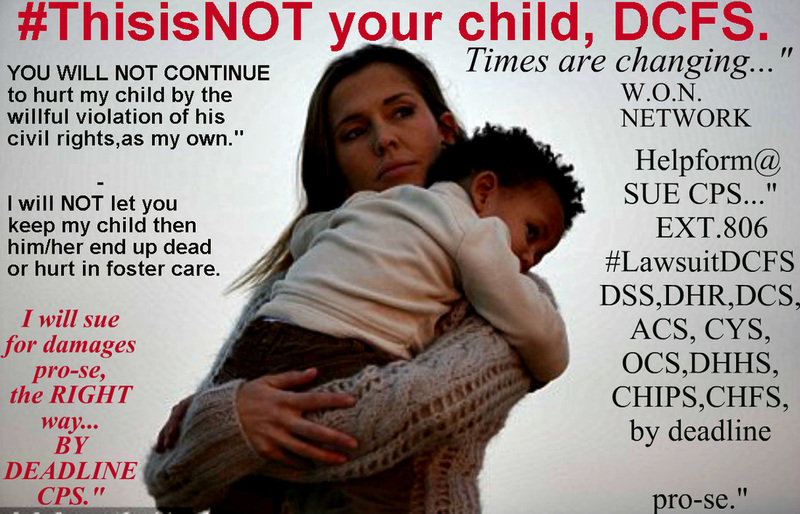 To file suit against NORTH CAROLINA DSS,read more below,then call the center to begin same day. E-HELP form on our main page/home page or simply click below or above at anytime. Quite rare,to find 1 lawyer to "care to sue." As our founder has astutely done, many more are learning to sue timely by pro-se method against abhorrent DSS,by deadline. then call to begin your 1-on-1 today." DISCLAIMER FOR ALL OUR READERS,AS SEEN OVER AT OUR POPULAR FACEBOOK,and throughout the site: --- DISCLAIMER: Not a lawyer. Be sure,to always call on lawyer first,to see if he is going to be able to represent you, and call more than one. Student&informational CHAT-1-ON-1 discussion online support chat ctr. pro-se(self file)resource ctr.only focus on what has been expound in such site disclaimer(s)-and facebook. Ext.260/102. Such specialize research available,for which you are pro-se,self file,as bella was. ... If your attempting to find lawyer to sue child protection services be sure to look aggressively. Call as many as feasible. Time will run out to sue sadly for many who have not sued cps in a timely fashion,as clear research on such relevance support. ext.260 ext.102 ... Be sure to always call a lawyer, to represent you. --- Even if "1"do not seem caring enough to properly represent you, your to call as many as feasible. If not,your able to as owner has done the founder,ms.melendez ext.260 to sue pro-se,self file timely by deadline.Good luck to you all. ---------- This web site is intended for informational purposes only. Nothing contained herein constitutes legal advice, nor is it intended to give legal advice. STUDENT Online Effective, Research,1-on-1 student ctr. 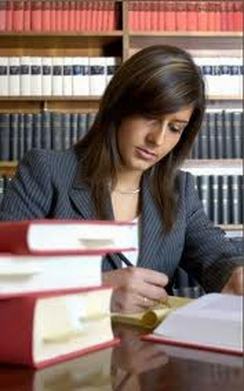 are NOT lawyers naturally. Call as many lawyers as you can. NEVER GIVE UP. Ext.102/Ext.1/Ext.260. --- Specialized-Online Internet Public Research@Bellas. 1st of its kind,student online 1-on-1 video conference to phone-in session available. --- Information shared clearly protected,per request,by our First Amendment, freedom of speech,per research session for which your requesting in a timely fashion. ext.102/260. ... DISCLAIMER: NOT A LAWYER. ALWAYS CALL LAWYER FOR REPRESENTATION. NEVER GIVE UP... ext.102 ext.260. --- You should not construe this information as legal advice in any manner whatsoever. All disclaimer(s)are clearly expressed throughout online & offline. --- Now: If your suing pro-se(self file) as the founder successfully on her own,as daughter,their family has done,as MEDIA verified 2013-2014,if your suing as founder has pro-se? 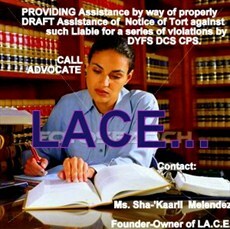 Be sure to keep moving forward,positive,and remain focus,on you,and why your suing pro-se self file timely. --- NEVER GIVE UP. ext.102 ext.260. 1-844-244-8860 --- THE TIME IS ALWAYS RIGHT...TO DO WHAT IS RIGHT . . . MARTIN LUTHER KING JR.